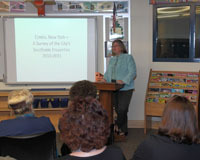 Kaye Newbury, Historic Elmira President opens public meeting. Tania Werbizky, Regional Director, Preservation League of NYS. Robert Englert, Historic Preservation Program Analyst, NYS Office of Parks, Recreation, and Historic Preservation. 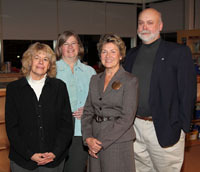 Tania Werbizky, Nancy Goblet, Kaye Newbury, and Robert Englert. 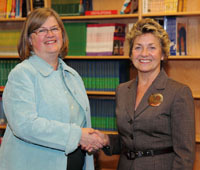 Nancy Goblet and Kaye Newbury. Nancy Goblet, Tania Werbizky, Kaye Newbury, and Robert Englert present the finished survey.